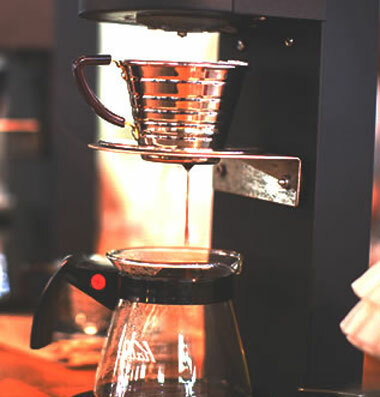 THE TRUTH ABOUT BREWED COFFEE - Marco Beverage Systems Ltd.
It’s got to be said, brewed coffee in Europe is in pretty bad shape. 1. Caffe Culture – London, UK. May 2009. James Hoffmann, as star an attraction as one could have as lecturer, commands an audience of 4, that’s four, at a lecture on brewed coffee. He had a full house of 50 at an earlier Espresso lecture. SCAE cancel a one day Gold Cup Brewmaster lecture due to lack of interest. We would have run it if 5, that’s five, had enrolled. Out of a UK population of 60 million! Some of them may be kids, but you know what I mean. SCAE run a workshop entitled ‘Filter Coffee- Where the money is’. We run the workshop even though only 2, that’s two, people enrolled. The filter coffee consumption in Ireland, UK and mainland Europe is a huge percentage of overall out of home sales, approx 70%. That’s a huge prize. The scramble for filthy lucre has led the coffee industry by the nose into the dirt. Coffee accountants have insisted on reduced costs. The result? reduced dose, poor quality coffees, immoral exploitation of farmers. Coffee scientists have manipulated the accountants’ reduced dose to maximize coffee strength in a bad cup. The result? Over roasted, finely ground coffee yielding a bitter burnt cup. Coffee marketers have told the ignorant public, through swishy ads, shiny loyalty cards and nods to ethical purchase policies, untruths about the coffee quality. The result? The public has been bamboozled into believing bad coffee is good coffee. Let’s start small. I’ve been banging on about measuring brewed coffee and scientifically extracting it properly for about 5 years now. I’m still convinced learning through objective analysis is much more powerful than learning through subjective rumourmill. Colin Harmon said in Cologne ‘it’s better to have an opinion on a fact than have a fact on an opinion’. My current favourite quote. He’s too young to have thought that up. We must educate and be educated. I believe the fight to bring good filter and brewed coffee into the mainstream will be a long an arduous one. But if it is based on fact, we can expose the charlatans and embarrass the perpetrators. It’s what Fairtrade et al did, irrelevant of your views on those bodies. In a funny way, the espresso will save brewed coffee. The World Barista Championships, ably abetted by a flat world served by online social networking and real time communication has delivered the saviours. The barista community which gathers at national and international barista championships worldwide is predominantly there to compete in an espresso world. These guys love brewed coffee. ‘To a good barista, it may be espresso at work but it’s a brewed cup at home’. A quote from a guy called Hoffmann. This passionate community is educating itself, sharing its findings globally, and querying why day to day coffee experiences are crap. It will take time. Youth is on their side. Youth, knowledge and passion. Hard to beat that combination. I hope.